September Botanical tapestry shows an illustration of the blooms of September based on the work by Robert Furber (1674-1756). This vase of bountiful blooms is based on a traditional illustration set showing the flowers of each month of the year created by Furber, a British horticulturist. The originals were published in his book, the Twelve Months of Flowers, in 1730. Here we see gorgeous blooms of all colors, including whites, yellows, pins, reds and blues., accompanies by green foliage. 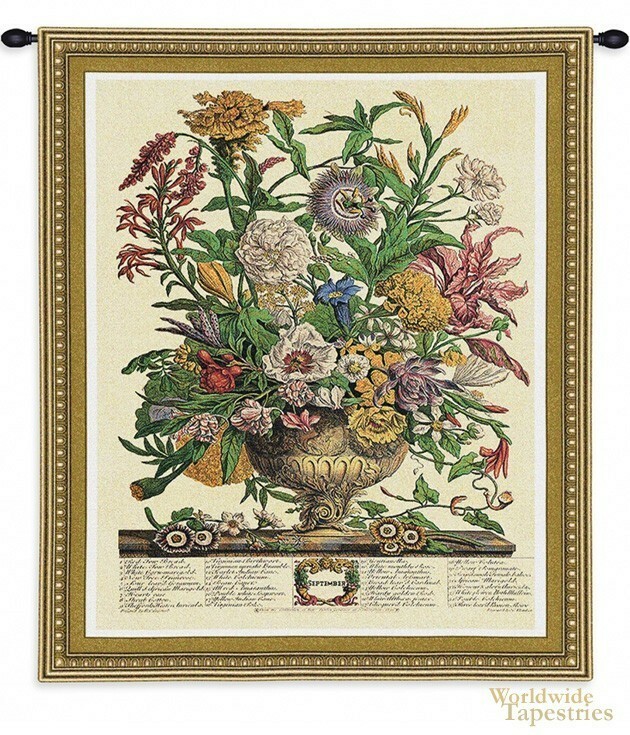 The illustrative style is typical of the 18th century era of the studies of flowers, making this a botanical study as well as a piece of art at the same time. September Botanical tapestry is backed with lining and tunnel for easy hanging. Note: tapestry rod, where pictured, are not included in the price. Dimensions: W 26" x H 32"